This intermediate ceramics class is recommended for continued development of pottery wheel, hand building, and surface decoration skills. Focus will be on intermediate level projects, and as a natural expansion of basic skill levels. Students are highly encouraged to develop their own projects. In-class demos and suggested projects will cover studio safety and a variety of methods including; lidded forms, plates, multiples, making templates, altering thrown forms. Multiple surface decoration options also covered from custom stamps, mono printing, screen printing, drawing transfers, to slip trailing. Each class session offers demos and discussion as well as plenty of studio time to work on projects. You’ll need only need to bring a 1 gallon bucket, a 1 gallon lidded container, and your own favorite tools if you have them. Basic supplies provided; clay tools, stoneware clay, underglaze colors, and clear glaze (all food safe). Concurrent with your class enrollment, you can access the studio for a minimum of 6 hours per week for open studio time to complete projects, hone ceramic skills and to have fun! The specific open studio schedule for the term will be determined by the start of the class and will include some weekend daytime hours. Prerequisite: Intro to Hand building + Wheel, or previous basic ceramic experience. Liz Harris received her BFA in Intermedia from PNCA. Her work is based in sculpture, animation and video, which often culminate into installations combining all three disciplines. 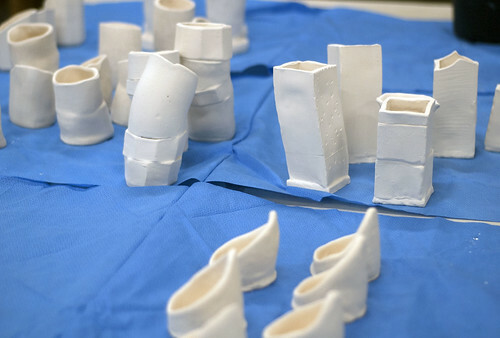 She is investigating the making of multiples in ceramic with a focus on craftsmanship, the labor involved, repetition and the perceived self-worth through the production and accumulation of multiples. Liz has shown her work at the Linfield Gallery; ZGF Gallery, Place Gallery and PNCA’s BFA Gallery.